The Foreign Secretary arrived in Saudi Arabia today (Sunday, 29 May 2016) at the start of a three-day tour of the six Gulf states. During the visit, Philip Hammond will meet leaders in Saudi Arabia, Kuwait, Bahrain, Qatar, the United Arab Emirates and Oman to discuss a wide range of regional and international issues, including the vital role that the Gulf countries have in countering Daesh and working to overcome regional challenges such as the situations in Syria, Iraq, and Libya. The Foreign Secretary will emphasise the need for all countries to work together on key regional issues including the crisis in Yemen, about which UN-facilitated peace talks are currently underway in Kuwait. The Foreign Secretary will meet the UN Special Envoy to Yemen, Ismail Ould Cheikh Ahmed in Kuwait during his trip to reiterate UK support for the peace process. Philip Hammond will restate how important the Gulf’s security is to the security of the UK, and that close relationships with Gulf countries are vital in keeping Britain safe. 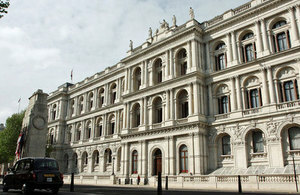 As usual on all visits to the region, the Foreign Secretary will raise consular and human rights cases. The visit comes at a time of change for Gulf nations, as they face the challenges of falling oil prices and work to ensure their future prosperity through economic diversification. The Foreign Secretary will outline the UK’s expertise in a wide range of areas where the Gulf countries are considering reform including Public Private Partnerships, healthcare, education, and public and financial services. Wherever we look, the world is becoming more dangerous and more uncertain. International engagement is fundamental to maintaining both Britain’s security and our prosperity. Britain’s strong relations with the Gulf states enable us to work together on regional challenges and shared threats that confront us, whether from violent extremism, terrorism, or volatile economic conditions. The crisis in Yemen will be high on my agenda during discussions in the Gulf. Allowing the state to collapse is simply not an option. Britain is continuing to work together with all parties to support a comprehensive political solution to the conflict.